The return of the famous shared-world superhero books created and edited by George R. R. Martin, author of A Song of Ice and Fire For decades, George R.R. 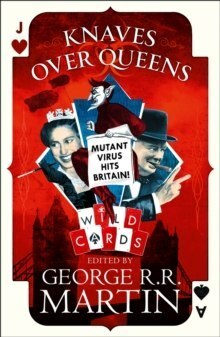 Martin - bestselling author of A Song of Ice and Fire - has collaborated with an ever-shifting ensemble of science fiction and fantasy icons to create the amazing Wild Cards universe. In the aftermath of World War II, the Earth's population was devastated by a terrifying alien virus. Those who survived were changed for ever. Some, known as Jokers, were cursed with bizarre mental and physical deformities; others, granted superhuman abilities, are known as Aces. Now the virus has reached Britain... Queen Margaret rules over a country in which such legendary figures as Herne the Hunter, Spring-heeled Jack and Babh, the goddess of war, roam at will. Her Prime Minister, Sir Winston Churchill - gifted with extraordinary longevity - together with the Enigma ace - Alan Turing - set up a special organization named the Order of the Silver Helix. They will need all the wild cards they can find if they are to deal with the terrifying mutations thrown up by the virus. KNAVES OVER QUEENS - the first ever Wild Cards novel set in the UK, and a perfect jumping-in point for readers new to this shared world - features a stunning collection of original stories from such luminaries of the world of science fiction and fantasy as Paul Cornell, Marko Kloos, Mark Lawrence, Kevin Andrew Murphy, Emma Newman, Peter Newman, Peadar O Guilin, Melinda M.
Snodgrass, Caroline Spector and Charles Stross.